Sticking unnecessary adverbs in after lines of dialogue. Like, “I don’t seem to trust my readers to infer tone from what’s being said,” she said worriedly. I like to cram as many words/jokes into a sentence as humanly possible—often including asides within dashes (or parentheses! )—and while my aim is to amp up the humor with verbosity, I realize that it often has the opposite effect. If a line is poignant or funny, it’ll usually have more impact if it’s pared down to its most essential words. Having characters live too much in their own heads. It’s always better to show how someone feels through action and dialogue than to tell it to readers directly through the person’s inner monologue. Describe your writing style in 5 words or less. Clever conversation with tipsy friend. Do you ever base characters off people you know? Why or why not? I don’t base an entire character’s personality on anyone specific, but I absolutely borrow traits and quirks. Part of it is just that it makes developing characters easier if you can pick details out of real life experience, but also I love leaving Easter eggs for my family and friends to recognize. I’ll only use something if it’s flattering or if it’s funny enough that it won’t be taken seriously (for example, a good friend of mine is really into Eastern medicine—specifically colonic therapy—and so I had a camper in Five Summers with her same first name reading a book about it. She took it in stride.) Obviously in my nonfiction I write about my husband, my parents, and other assorted real people whom I love and don’t want to hate and/or divorce me, so I tread very carefully with how I depict them. I’m willing to poke fun at some of their personality traits, but again, only if I’m reasonably sure they won’t be offended. Even just describing someone I know in real life can be frightening, because what if they read it and think, “Is that how she sees me?” I keep telling my friends that there’s almost nothing about them in Unabrow but that it’s because I love them too much to risk it. (For the record, I love my husband, my parents, and my sister, too, but since they’re the closest people to me in the world they’ve already accepted that there’s no escape. Sad trombone for them.) 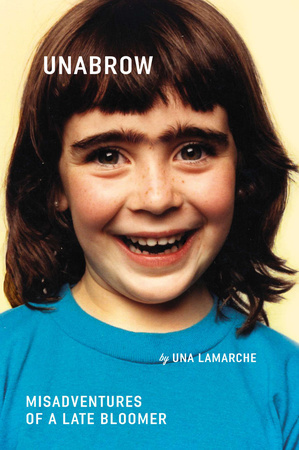 Read more about Una LaMarche‘s book, Unabrow, here.